Big Bear Chili Cookoff – July 11! 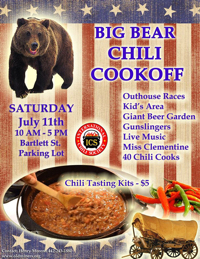 Big Bear Chili Cookoff Saturday, July 11th 10:00am – 5:00pm Bartlett Street Parking Lot Outhouse Races Kid’s Area Giant Beer Garden Gunslingers Live Music Miss Clementine 40 Chili Cooks Chili Tasting Kits: $5.00 This is an official International Chili Society sanctioned event. If you can get here, GET HERE!